Thanks to a generous grant from the San Diego Yacht Club Sailing Foundation, 30 at-risk and under-served kids, who may not have otherwise had the opportunity, will be able to experience sailing this summer. The grant provides camperships for kids-in-need to participate in a week long sailing camp at The Watersports Camp where they will not only learn to sail, but will also experience the many other benefits of camp, such as building self-esteem and developing leadership skills. The camperships are allocated to organizations who outreach to deserving youth, as well as to individuals in need who apply directly with MBAC. In cooperation with the Armed Services YMCA, many youth benefit from the grant are children of our military personnel serving our country. The original intent of the Foundation was to use donations to support the Yacht Club Junior Sailing Program founded by Joe Jessop in 1928, and whose mission was the development of young sailing enthusiasts. Since then the Foundation has grown in size and scope, offering opportunities for all youth in the community to participate, experience the thrill of sailing, and develop the skills and confidence that come with good seamanship. Funds are raised through individual donations and through other events such as golf tournaments. 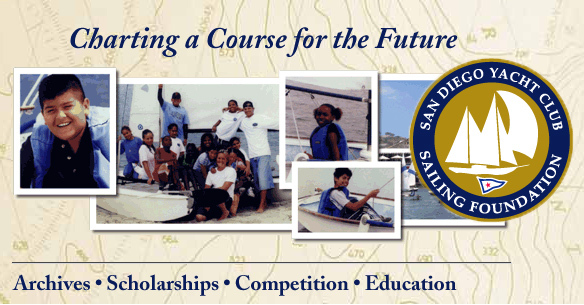 For more information about the San Diego Yacht Club Sailing Foundation please visit their website at sdycsf.org. You can learn more about applying for a campership at www.watersportscamp.com/rates.htm#camperships. We thank the San Diego Yacht Club Sailing Foundation for their generous donation and years of supporting youth community sailing.